A flattering, stylish black zip up top by Karen Millen. The size is a 3 which is about a size 12. 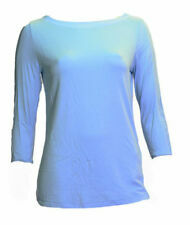 The top has only been worn on a couple of occasions and is in terrific condition. It comes from a pet and smoke free home. I will post 1st class on purchase. Ladies short sleeve Black Karen Millen Top Size 8. Excellent condition from a smoke free home. Sheer look with black side zip and silver studs to front, silver button loop fastening to the back. Dispatched to the UK only with Royal Mail 2nd Class. This is a really eye catching top from Karen Millen in a soft slightly stretchy fabric at the front and a sheer black fabric at the back. The size label has been cut off the back neckline as it showed through the fabric when worn. Beautiful Karen Millen Blouse Size 8. Perfect Condition. Beautiful Karen Millen Blouse Size 8. Used but in perfect condition. Rrp £89. Dispatched with Royal Mail 1st Class. Karen Millen Black Blouse, Size 16. Condition is Used. Dispatched with Royal Mail 2nd Class. KAREN MILLEN LACE BLOUSE SHIRT BEIGE COLOUR WITH TRANSPARENT SLEEVES SIZE 8 UK 36 EU. 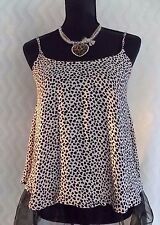 KAREN MILLEN TOP SIZE 2. DOTA 2ND HAND & NEW. Karen Millen - size 10. Black with black sheer cut out detailing to the sides and sleeves. Sheer back panel. Collarless with concealed button fastening to the front. Lovely shirt from Karen Millen black with spots all in shades of black, long. Model: TA168. The blouse takes its influence from Japan, with contrasting black piping, concealed fastening, zipped blouson style sleeves and a high neckline. I have reattached the original labels to the blouse. Karen Millen Black coated shirt. Button at front. Tie bow around the neck. Silver section on the sleeves of the shirt to keep the sleeves up if required or you can have the sleeves long with button on wrist area. Perfect condition. Everything I sell is top quality and genuine. Please see my reviews. You will not be disappointed. Karen Millen. Button Sleeve Drape Top Blouse Shirt. Black Gold High Neck. Karen Millen Lightweight Floral Blouse. In this season's must-have coral hue, this blouse will instantly brighten your mood. - Coral floral lightweight blouse. High St Price £125. Uk Size 14. Fabric: Main, 100% polyester. Black, see throughmaterial, size UK10 / US6 / EU38. Size 8 Karen Millen Top Blouse Navy Cold Shoulder. Photos do not do it justice. A fairly sheer fabric with a front inner sheer modesty lining. Very elegant. Karen Millen ladies pretty shirt with black lace around neck area. Brand new with original price tag of £125. Please check out my other items listed. 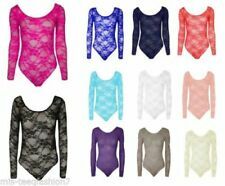 Am selling lots of girls/boys and women's clothing. If you are u satisfied with your item, upon receipt, please contact me, prior to leaving feedback, so I can rectify the matter. I do offer combined postage and aim to post within 5 days. If you require your item sooner, please message me. Black edging to v-neck with tie. Chevron style lace on shoulders and back yoke. Button cuffed long sleeves. 100% polyester so washable. In good condition. Exquisite lace blouse from Karen Millen. Beautiful detailing : embellished with sequins and beads throughout. Ruffle collar and angel style sleeves features different charms, including cross, crystal pendants, heart pearls etc. 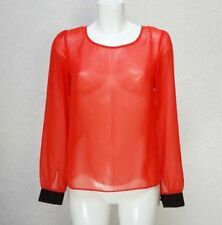 A SUPER KAREN MILLEN LADIES/ GIRLS BLOUSE/ SHIRT/ TOP. SLIGHT STRETCH IN THE FABRIC, BLACK, STRIPED BLACK AND CREAM. LONG SLEEVES. BUTTON CUFFS. Blouse, designer Karen Millen. UK size 8. Colour cream. Long sleeves with contrast border at cuff and button fastening. Round neck in contrast material, button fastening at front. Two pockets on bodice. Karen Millen green crochet cardigan. Size: Karen Millen size 1. Would best fit a UK 10. Colour: green, blue. Condition: Worn once. Fantastic condition. Karen Millen Cut Out Shoulder Devore Blue Textured Smart Shirt Blouse Top 8 36. Condition is Used but in very good condition Work this season’s highly sought-after cold shoulder trend into your wardrobe with this perfectly executed design from Karen Millen. Cut to a loose-fitting silhouette with a v-neckline and seventies-inspired tapered sleeves, it’ll lend all your looks a feminine feel Dispatched with Royal Mail 1st Class. THE MOST SOUGHT AFTER, KAREN MILLEN. LONG SLEEVE EMBROIDERED BLOUSE size 10 UK. STYLE CODE- TA056. Women's KAREN MILLEN Striped Long Sleeve Jumper/Top, M (on label S) ,Good cond.